Seeing a recommendation for The Color of Law by Richard Rothstein, on the Racial Justice Allies Facebook page, I reserved it at the library, wanting to keep up with recent writing on institutionalized racism in the U.S. When I picked up the book I saw the subtitle—A Forgotten History of How Our Government Segregated America—and was disappointed as I’d already read about red-lining, VA loans, restrictive covenants, urban renewal, and conspiring real estate agents. But I took it home thinking I’d skim it. Instead, I ended up reading it through with horror. Rothstein has painstakingly documented a planned, systematic illegal approach to keeping African Americans out of white neighborhoods and also destroying already-integrated neighborhoods through various policies. Every time the courts ruled one particular approach to segregating housing illegal, governing bodies at Federal, state and local levels strategized how to evade the ruling or simply continued to violate the law. 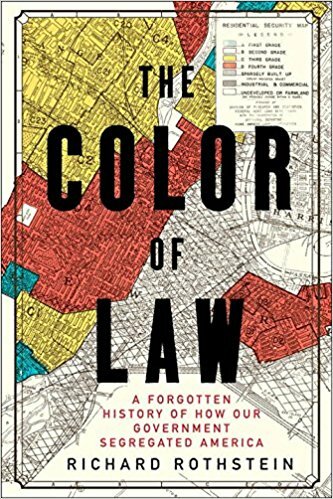 The Color of Law quotes from guidelines and regulations, public speeches, inter-personal communications, newspaper reports, and court documents to demonstrate how segregation was planned by powerful men, implemented through law and policy, and enforced by police and courts, up through today. Rothstein also analyzes data to show how segregation has curtailed economic advances for African Americans, not only through inability to take advantage of real estate appreciation but through being forced to live in areas where good jobs were not easily accessible, where schools had fewer resources, where zoning created health hazards, and where local government often found ways of extorting money from them with taxes or fines. The law created an environment where black Americans were forced into ghettos and then white Americans could feel justified in keeping them from their white neighborhoods, fearing that it was the presence of African Americans that created ghetto conditions. This story of white fear and white flight was one I had absorbed. Little did I know that white men conspired to drive white families out of neighborhoods with black residents using an arsenal of tricks, and then created the story for public consumption that implied that it was white fear that led to white flight. Many stories of individual struggle by black men and women to obtain housing are recounted, alongside the tactics used to deter them and force them into substandard dwellings in areas in which they did not want to live. The 5th, 13th, and 14th amendments awarded constitutional protections to African Americans. The stories in The Color of Law illustrate how the law subverted these protections. Segregation did not “just happen” in the U.S. It was created by government. I found myself almost in shock as I read, even as I was also not surprised. This is information I need to have. And I appreciated that Rothstein included education in his chapter on fixes. Widely used history textbooks published as recently as 2012 mention residential segregation in the North: “African Americans found themselves forced into segregated neighborhoods.” An entire book, The Color of Law, breaks apart that statement and changes it from passive to active voice. I highly recommend you read the book. 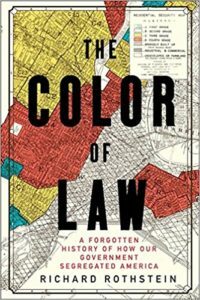 The Color of Law: A Forgotten History of How Our Government Segregated America, Richard Rothstein. Liveright: 2017. 2 Responses to "The Color of Law: Review"
How long will we continue being surprised by the illegal treatment people of color has lived with for centuries? Let’s face it – what some call “The Dominant Society” (the white dominated culture) isn’t doing a great job running our country because they focus on their self-interest, not the interest of the entire country. This is not just in law, but in every aspect of life. I mean, how do they think black people feel and talk quietly among themselves about the country’s response to the opiod problem, while knowing full well how the government allowed cocaine to enter this country and negatively and mostly affected the black community. And instead of getting prison sentences, those addicted, mostly white people, are encouraged to get help and our tax dollars (yes, black people pay taxes) are being offered to assist them. What!! So instead of always feigning surprise as how we have been treated for centuries, let’s do something. We spend over 500 Billion annually in this country and we’re being taken for granted. No job? Why can’t our wealthier people develop jobs and job training in our communities. Health? We’d better start taking care of ourselves as the country’s health program is becoming costlier. Reacting to the racism and struggling for change will take centuries. Dr. King reminded us that we’ve been waiting too long.